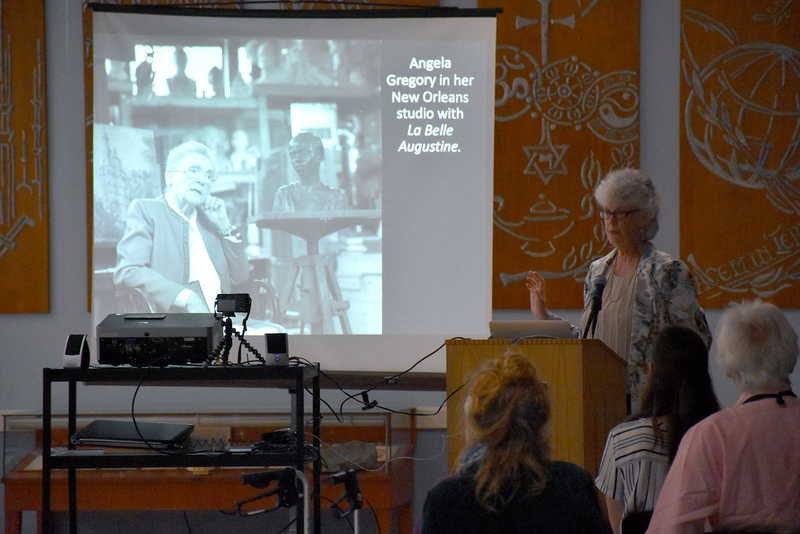 In Alumnae Hall, surrounded by the artwork of Angela Gregory, author Nancy L. Penrose addressed an audience about the book she co-authored with husband Gregory, A Dream and A Chisel: Louisiana Sculptor Angela Gregory in Paris • 1925-1928. 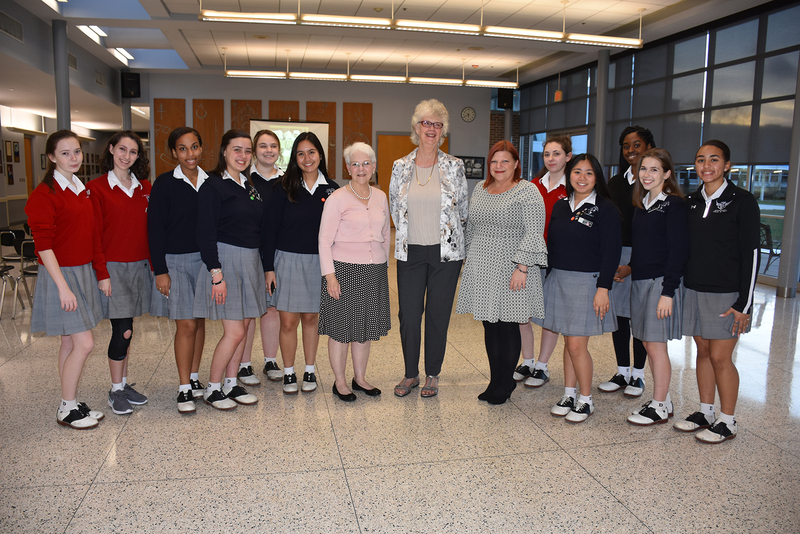 Also presenting was Susan Hymel, Angela Gregory historian and representative of Gregory Art, the family’s trust to preserve and promote her remarkable work on art in Louisiana museums and historic buildings. Hymel met Gregory in 1970 and is dedicated to preserving the artist’s legacy. Madeline Munch, a 2013 St. Mary’s Dominican High School graduate, cataloged and scanned original materials in Tulane University’s Louisiana Research Collection relevant to the memoir of Gregory. 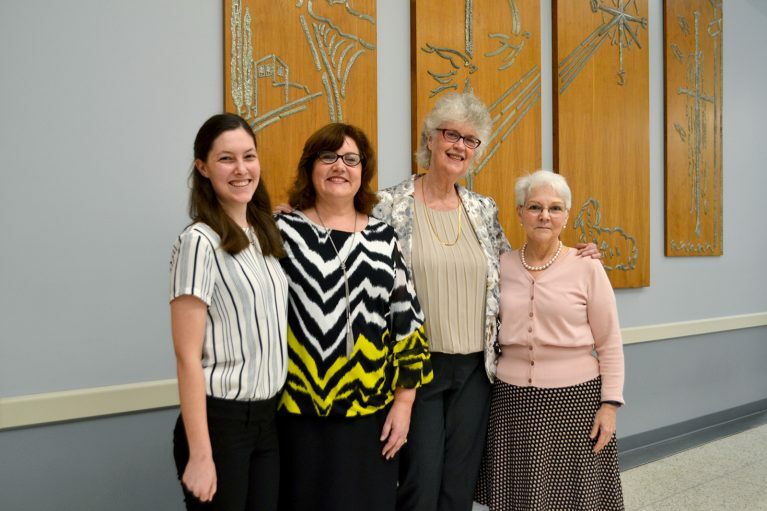 Madeline Munch (’13), Vice President of Advancement Jamie Lassere, Nancy L. Penrose, and Susan Hymel at the presentation of the book, A Dream and A Chisel: Louisiana Sculptor Angela Gregory in Paris • 1925-1928. The idea for the book began in 1983 when Penrose first met Gregory who was 83-years-old. Penrose was on the staff of Tulane University’s Office of Development and assigned to interview Gregory at her Pine Street Studio near the university about the bronze medal she designed for members of the Paul Tulane Society. The artist worked from the Pine Street studio for more than 50 years. She shared with the author a desire to write a book about her formative years in Paris where she studied at Antoine Bourdelle’s Studio. The book is based on the several interviews Penrose did with Gregory who gave the author her letters and diary entries during her Paris stay. Before her death in 1990, Gregory approved the final draft of the book. Nearly 30 years later, the book was published. Born in New Orleans in 1903, when Gregory was 14-years-old she declared her desire to become a sculptor. Her parents encouraged her and Gregory started formal art studies in summer classes at Newcomb with Ellsworth Woodward who taught her clay modeling and relief casting. In 1921, she began studies at Newcomb College of Art and graduated in 1925 with a Bachelor of Arts in design. That same year, she received a scholarship to study illustrative advertising at Parson’s School of Fine and Applied Arts in Paris. However, Gregory was determined to study “stone cutting” with the acclaimed French sculptor Bourdelle who was a protégé of Auguste Rodin. She was the only American accepted as one of Bourdelle’s students. While working with Bourdelle, Gregory sculpted a limestone copy of the “Beauvais Head of Christ,” later exhibited at the Salon des Tuileries in Paris. Gregory returned from France in 1928 and set up a studio in her parents’ home at 630 Pine Street. Shortly afterward, 25-year-old Gregory was commissioned to do the architectural sculpture on the façade of the New Orleans Criminal Courts Building at the corner of Tulane and Broad Streets. Hymel calls St. Mary’s Dominican High School one of the most accessible places of Gregory’s art. The artist’s roots run deep with the high school and St. Mary’s Dominican College where she was a professor and sculptor-in-residence for two decades. In Alumnae Hall, the John XXIII Library panels grace the north and south walls. In the northeast entrance to Alumnae Hall is Gregory’s mosaic of John XXIII’s Papal Coat of Arms. These works of art were originally completed for the John XXIII Library on the college campus. On the second floor of the Gayle and Tom Benson Science and Technology Complex is a sculpture design by Gregory, inspired by the life and dedication of Albertus Magnus, O.P., also known as Albert the Great, the Dominican Patron of Peace and Patron of Natural Sciences. It was located in the college’s Albertus Magnus Science Building. The bronze sculpture of the Blessed Virgin Mary is displayed on the second floor of St. Mary’s Hall. It was moved from the former Motherhouse, Dominican Sisters, Congregation of St. Mary. Following the book presentation, students in the National Art Honor Society escorted guests for a tour of the artworks.